The Cusco Type I lower arm bar features a tubular high-tension lightweight aluminum design, coated in anti-corrosive paint for protection against the elements. This bar improves body rigidity by connecting the lower arm points, thus preventing body flex and therefore dramatically improving steering rigidity, response and traction. The Cusco Type I bar is a 2-point setup and includes all the required hardware for installation. It bolts on easily using normal hand tools. The Cusco Type II lower arm bar features the same tubular high-tension lightweight aluminum design and anti-corrosion paint as the Type I. 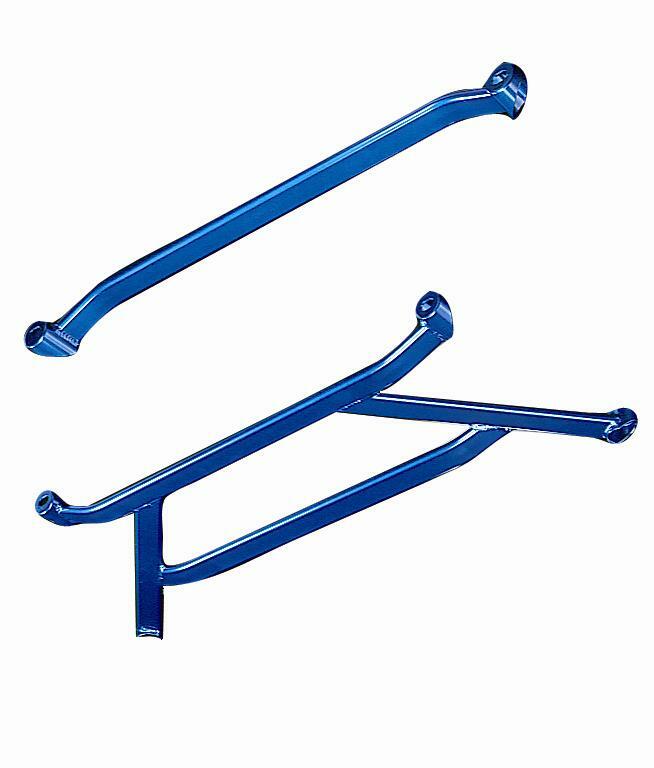 The difference though, is that this bar improves body rigidity by connecting the lower arm mounts in multiple positions rather than just two, thus greatly increasing the rigidity over the Type I style. Body rigidity is maintained on even the hardest of cornering and dramatically improves steering rigidity, response and traction. The Cusco Type II bar is a multi-point setup and includes all the required hardware for installation. It bolts on easily using normal hand tools.